Insulin and in more recent years, leptin, have gained much attention among horse owners for a variety of reasons. In most cases, the two hormones are often associated with metabolic syndrome in the horse and the increased risk of laminitis. Despite the increased attention to both insulin and leptin, many horse owners are often at a loss of how to interpret these values and what they actually mean regarding their horse’s health. Should you truly be concerned about these two values or is there a bigger problem, or a bigger picture that you should be focusing on in order to benefit your horse with perceived leptin or insulin resistance? There are many hormones that are created and released within the horse’s body on a daily basis that impact normal health and cellular function. Insulin and leptin have gained a large amount of attention in recent years and elevations in both generally coincide with metabolic syndrome in the horse. Many horse owners with the easy keeper type, especially if laminitis is a concern, are likely very familiar with having blood drawn to evaluate these two hormones. As an owner, you likely have values reported back to you by your veterinarian, but do you truly understand what they indicate and how to best intervene? Insulin is a hormone produced by the pancreas with the main function of helping to move sugar molecules into the cell to facilitate energy production. Insulin levels generally rise with food intake, as the sugars present in the food will stimulate insulin production. The degree to which insulin is produced, in response to a given food, is dependent on the glycemic index of that food, which is how readily available the sugars are for absorption. A spoonful of sugar, as an example, has readily available simple sugars which will be absorbed quickly and create a quick insulin surge or spike in production. In comparison, other foods have more complex carbohydrates or sugars which require more processing time during digestion, to break them down into more simplistic forms for absorption. These foods have a lower glycemic index. Green foods, such as vegetables and other forages are an example. This more complex form of sugars produces a slower rise in insulin production, rather than a quick spike. Leptin, often referred to as the ‘satiety’ hormone, is produced by adipose tissue or fat in the body. The hormone is produced, present in the blood stream, and inserts its action on the hypothalmus in the brain, creating a decreased state of hunger or a sense of satiety. The main purpose of the leptin is to help regulate energy expenditure in the body and control fat stores. Ghrelin is a hormone that opposes leptin, and is the ‘hunger’ hormone, stimulating an appetite in the horse, while leptin suppresses the appetite. Equine metabolic syndrome is not too far removed from metabolic syndrome in the human. It is a syndrome, as there are several facets to the disease process, creating several clinical problems for the equine patient. This condition is often directly associated with increased weight gain and reduced exercise in the horse. These two factors are the primary underlying contributors, but the end consequence is what creates the clinical problems in the average metabolic equine patient. When a horse owner with a metabolic equine patient has blood levels determined for these two hormones, often the levels are reported as being ‘high’ or outside of the normal range. These high levels generally are indicative of ‘resistance’, whether that be insulin or leptin resistance. While this is true in many cases, it is not always correct. Even if true resistance was present, whether if insulin or leptin, the ultimate question is what does this mean for the owner or the horse? Look at these hormones as being keys that fit into a lock. When the key is inserted into that lock, something happens in the body or in the cell. 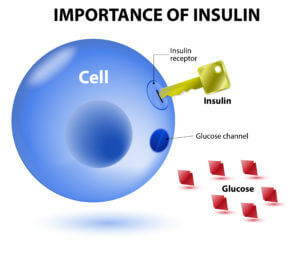 In the case of insulin, when it is inserted into a lock or receptor in the cell wall, it helps to move sugar molecules into the cell. In the case of leptin, when it is inserted into a lock or receptor in the hypothalmus, the appetite levels begin to drop. If you block the lock mechanism, which is the cellular receptor, then in theory, you end up with a higher level of unbound or circulating insulin and/or leptin. This is technically a state of resistance, higher levels of circulating insulin or leptin in the horse, as a result of the receptor or lock being blocked or not functioning correctly. This is in comparison to either an excess production of either of those two hormones or a decreased production. Technically, in cases of insulin or leptin resistance, the hormone is likely being produced normally, but is just not able to engage in the lock or receptor, thus levels are increased in the blood stream. True diabetic conditions, type I or II, are rare in the horse. The question is what creates this blocked receptor or lock mechanism in the horse? What creates this state of insulin or leptin resistance in the horse? Is this insulin or leptin resistance truly the “MAIN” problem or is it a secondary issue? Chronic inflammation is a complex cellular process involving many steps or events in the body and is an event that is precipitated by many other events. In human research, the process of chronic inflammation in the body has been closely linked to almost every health condition, with metabolic syndrome and insulin/leptin resistance being just one of them. The same is likely very true in the horse, as our physiology is not too far removed from theirs on a cellular level. The process of chronic inflammation is beyond the scope of this article, but the take-home point is that this cellular signaling process is directly tied with the insulin and leptin resistance in the horse. The inflammatory proteins directly impact not only the secretion or release of insulin or leptin, but also impact the function of the receptors on a cellular level. When the receptors are altered in their function, insulin and leptin cannot bind properly, and thus, their levels will rise in the blood stream. This is insulin and leptin resistance. The receptor becomes ‘resistant’ to binding the hormones in the horse as a result of the inflammatory process present. In equine metabolic syndrome, the levels of inflammation are often elevated compared to the normal horse. An overweight body condition, with higher levels of fat accumulation, are often directly associated with an increased level of inflammation in the body due to the fat cells secreting their own inflammatory proteins (adipokines). So, just by being overweight, increases the levels of inflammation and also the negative consequences. Additionally, many of these equine metabolic patients have a reduced level of exercise, often being confined to a dry lot or small paddock with little movement throughout the day. A lowered level of physical activity not only reduces calorie burn in the horse, contributing to increased weight gain, but a lowered level of exercise is also directly linked to higher levels of internal inflammation. Stress is also a major contributor to increased levels of inflammation in the equine metabolic syndrome patient. Stress is a physiological response by the body to a stressor. This stressor can be a state of non-health in the horse, implying that they do not feel good physically, which then creates internal stress due to a state of dis-ease or lack of homeostasis. Additionally, stress can be created in the horse in response to being confined to a small paddock with little movement. Stress can also be created by pain associated with laminitis, or even associated with a nutrient deprived diet. The diet being fed to the average equine metabolic patient can also work for or against you, just as it does in human medicine. Diets that are higher in processed food components, with artificial ingredients, additives and preservatives are generally connected with higher levels of inflammation in the body. Diets that are natural, whole-food based, and lower in grains are generally healthier and associated with lower levels of inflammation. Likewise, you need to remember that any horse that is unhealthy, or clinically sick, is in a state in which there is a higher demand for nutrients to facilitate cellular repair. Interestingly enough, in many equine metabolic patients, they are on processed diets with a lower quality of forage provided for nutrient intake. This is done with the primary goal of reducing available carbohydrates, believing this is the ’cause’ for their condition. This state of nutrient deprivation can create an internal state of stress within the horse, and likewise contribute to more inflammation. For many, the choice or recommendation is to use a synthetic, often isolated nutrient source to fortify the deficient diet. The gastrointestinal tract can also be a prominent source of inflammation for the average equine metabolic patient. There is more to this organ system than just taking in food and digesting it properly. The microbiome is an extensive network of bacteria, protozoa, and yeast that are present throughout sections of the digestive tract, ideally in balance. When these microorganisms get out of balance, a dysbiosis exists, and this imbalance not only impacts proper food digestion, but contributes to inflammatory changes in the horse. These inflammatory changes can be linked to the bacterial types that overgrow, but it can also be connected to changes in the gut wall which is referred to as ‘leaky gut’ syndrome. These changes all contribute to increased levels of endotoxin in the blood stream which then contributes immensely to inflammation in the horse. When it comes to equine metabolic syndrome (EMS), increased insulin and leptin levels are very common. The increased levels are often correlated with resistance on a cellular level, and this resistance is closely tied-in and created by inflammatory changes in the body. In most cases when the hormone levels are elevated, it creates a state of tension for the owner, almost grasping at straws regarding management. The solutions for managing insulin and leptin resistance are few, in the medical world, which is what leaves many owners feeling helpless at times and also greatly reduces the overall improvement in these horses. Leptin and/or insulin resistance in the horse are a result of a progression or deterioration of the clinical problem in the patient. Metabolic syndrome starts off slowly and progresses over time. Many horses do not demonstrate leptin or insulin resistance for years, as their condition progresses. Thus, the problems of insulin or leptin resistance are not clinical problems in and of themselves, but signify a worsening of the inflammatory status of that equine patient. In many instances of research, it is noted that poor sugar regulation is often related to the failure of expression of GLUT-4, or that there is an over expression of endothelin-1, which impacts circulation in the laminitic IR horse patient. While these are true, one needs to step back and trace pathways to determine how or why there is an over-expression of endothelin-1 or decreased expression of GLUT-4. Human research indicates that inflammatory pathways are involved. If you begin to understand the connection between inflammation and the rise in leptin or insulin, you can then hopefully see that the inflammatory changes are the primary problem. The rise in insulin or leptin are actually secondary events, not primary ones. If you take measures to better manage the primary problem, being inflammation, the outcome for the horse can greatly improve in addition to better leptin and insulin levels. We will discuss options for better management of insulin and leptin resistance in the horse in another article.